These uniquely textured finish dress up kits from Proform will add style to any engine bay. These dress-up items offer a more "industrial" look that is quickly becoming popular at the shows and tracks. This highly durable, hard-shell black coating will not crack or peel and makes for an easy clean-up. These high quality dress-up pieces also feature the Bow-Tie and Chevrolet emblems in bold, eye catching red. Sold as complete kits or individually. 141-758 is rated 5.0 out of 5 by 7. Rated 5 out of 5 by Huntinnutz from Nice stuff! I have not installed any of this yet, it's for a future build, but I am very satisfied with the quality of everything in the kit, really nice stuff. Rated 5 out of 5 by Snakebrown from Great product. I bought it a month ago and still waiting to install the kit. Rated 5 out of 5 by Chevrolet69 from It looks great. I just got the product and it looks great on my truck the only down fall is that the wrapping paper took a bit of the color out of the Chevrolet logo. Besides that I like it. Rated 5 out of 5 by JHedrick from Amazing Engine Dress Up Kit!!! Waited a little longer than I should have to buy this kit.....now that I know how good the quality is and how nice it looks, I wished I would have bought it much sooner! Great kit and will make your engine look amazing! Rated 5 out of 5 by flacoperez from Beautiful I like the product. I'm surprise with this product because seeing it in front of me it looks so much better than it does on the picture. I haven't yet installed it but I know that as soon as I install it in my Camaro is going to look outstanding. I Just cant wait to the summer. 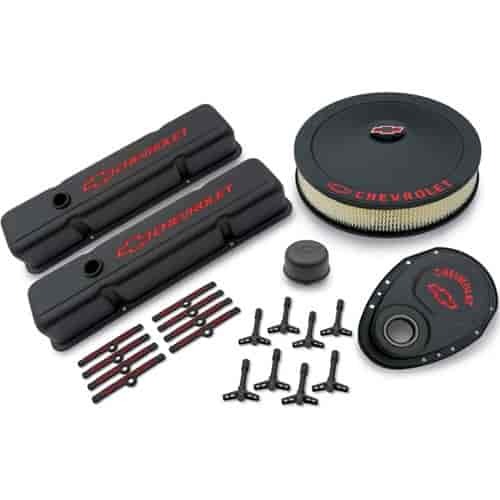 Can i get this kit with the short valve covers instead of tall? No, this kit only comes with the tall valve covers. Will this fit a TBI 350? The TBI engine typically uses a center bolt valve cover we have this Part Number: 778-141-105K for your application.